SunButter & Jelly French Toast Sandwiches are a fun treat for kids for breakfast or lunches! This recipe is allergen-friendly & egg-free, depending on the brand of bread you use. 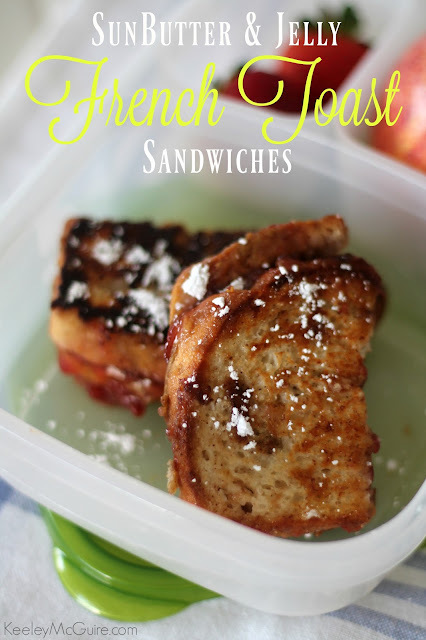 Making french toast for breakfast is always a fun change-up in our household. We are typically a pancake or eggs kind of family. However, I always challenge myself to make things as allergen-friendly (and gluten free) as possible when I'm working on new recipes or ideas to share here. Years ago, I was playing around with my own recipe for egg-free/ dairy-free apple cinnamon french toast. I decided to circle back around and find a way to amp that up + make a fun recipe that could be used for both breakfast or lunches! My apple cinnamon french toast recipe I mentioned above, I used applesauce & flax in my batter for the bread rather than an egg. It was good. Little Miss loved it, but it was missing something. When I stumbled upon this recipe by Kim Maes I loved the idea of using bananas but thought it might be a little strong on the flavor. So, I decided I could combine the idea behind the two recipes for a delicious egg-free french toast recipe, that wasn't too banana overpowering. 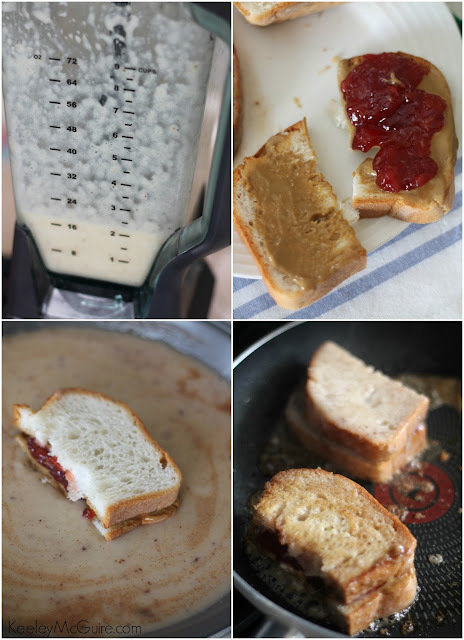 And what better way to add some kid-fun then making it into a SunButter & Jelly sandwich while we're at it!? You could of course use this recipe to make regular french toast. Throw the ingredients into the blender, spread the SunButter & jelly of your choice on the bread, soak in the batter mixture on both sides, and cook. It's that simple. 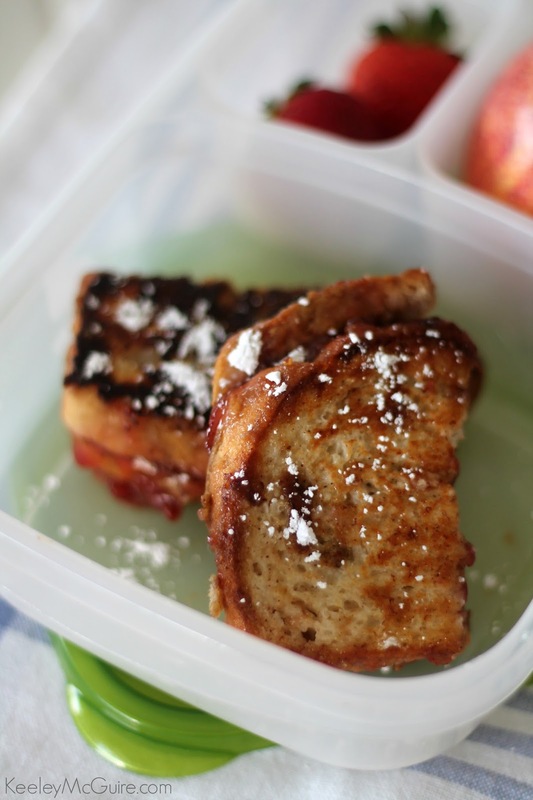 Note: If packing them for lunches, make sure to let them cool completely before packing them up in your lunch box - this will help keep them from getting soggy. *Note: If you cannot do applesauce, you could also sub for another mild sauce like pear sauce. In a blender, combine the banana, non-dairy milk, applesauce, cinnamon, vanilla, & salt. Blend until smooth. Pour "batter" into a pie pan or cake pan/ dish. Slice bread vertically in half. * Spread SunButter thinly on the inside of each half slice, then one side with the jelly/jam. Sandwich halves together to form sandwich. Dip each sandwich half carefully into the "batter" mixture, thoroughly coating both sides of the sandwich. I let each side sit in it and really soak up. Using a non-stick pan or griddle, turn to medium-high heat and add 2 TB of oil (or butter, if you can have/ prefer). Fry sandwiches until golden brown on each side. About 3-4 minutes on each. Continue process until all sandwiches are made, adding more oil to pan as needed. Sprinkle powdered sugar over top, serve, & enjoy! *Note: You could leave sandwiches whole and slice after, if desired. I sliced in half beforehand to help with a more even cooking and to make them easier to flip/ handle. Yes! Hello EGG-FREE breakfast fun! Haha! 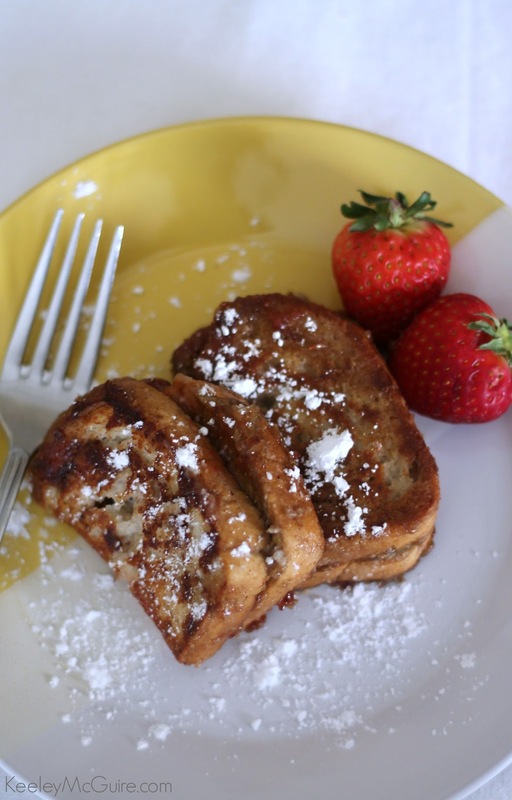 No one needs eggs for great vegan french toast! This is AWESOME Keeley! We've missed real French toast with our egg allergy. Can't wait to try this!